Phil Matier (’82) was inducted into the Hall of Fame in 2008. I can’t imagine a better student experience than working at the Arizona Daily Wildcat. In the early 1980′s the school and paper exemplified quality of journalism equal to anything I have seen in my 20 plus years in the field. Under the guidance of Don Carson, Clyde Lowery and the other faculty advisers, the Daily Wildcat produced a string of award-winning stories covering everything from hidden payments in the school’s basketball program, burn-out among the faculty at the School of Nursing, plus arts features and local news coverage. These stories won a string of awards. One of the highest awards, however, was never made public. It came one afternoon, when UofA President John Schaefer–who had himself been a target of more than one Wildcat expose–called me up to his office to compliment our coverage on a story that day involving one of his administrators. He just wanted to say “thanks” for being fair. Tough but fair– that is what the Wildcat taught us. Phil Matier is one of the most watched and read journalists in the San Francisco Bay Area. The Matier and Ross news column – co-written with fellow journalist Andy Ross – appears three times a week in the San Francisco Chronicle. The column mixes news, insights and analysis of California’s politics, personalities and, of course, San Francisco’s own brand of peculiarities. 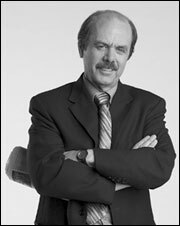 In addition to his print work, Phil is a regular on San Francisco’s CBS-5 television, appearing on the evening news and co-hosting the Sunday morning news. His perspective on the news can also be heard during the morning and afternoon commute on San Francisco’s KCBS radio AM 740. Phil is a sought after public speaker and a guest on many of the national cable news channels. Prior to working in San Francisco, Phil worked at the Tucson Citizen. I love this man! Phil Matier is amazing.